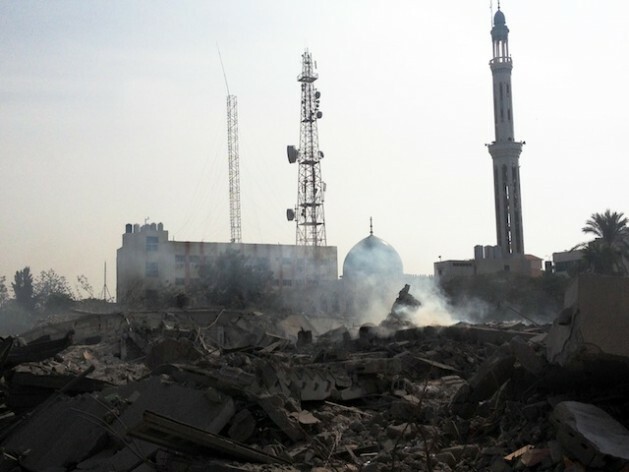 Ruins of the Abu Khadra complex for civil adminstration following an Israeli airstrike on Gaza City. Credit: Mohammed Omer/IPS. JERUSALEM, Nov 25 2012 (IPS) - As the ceasefire between Israel and Hamas seems to be holding, many are hoping that one of the agreement’s main points – the easing of restrictions on people and goods coming in and out of the Gaza Strip – signals a new era for the besieged Palestinian territory. “The people of Gaza cannot go back to the situation as it was before. This cycle of violence and de-development must end,” Ramesh Rajasingham, head of the United Nations Office for the Coordination of Humanitarian Affairs (OCHA) in the occupied Palestinian territories told IPS via e-mail. Israel and Hamas signed a ceasefire agreement on Nov. 21 mediated by Egypt and the United States, to bring an end to eight days of Israeli air strikes on the Gaza Strip and Hamas rocket fire onto Israeli cities. According to a transcript of the agreement released by Agence France-Presse, in addition to halting violence on both sides, the agreement stipulated that further discussions would be held to open the border crossings between Israel and Gaza, and ease current restrictions on “the movement of people and transfer of goods” from Gaza. According to local reports, Palestinian fishermen have been allowed to fish at a distance of six miles from the Gaza shore, up from three miles, for the first time in three years, and farmers allowed to work their lands within 300 metres of the border fence with Israel. Israel adopted more stringent restrictions in 2006 following the abduction of an Israeli soldier by Palestinian fighters. When the Islamic movement Hamas won Palestinian parliamentary elections and later ousted its rival Fatah party from Gaza – effectively dividing the occupied Palestinian territories into two entities, a Palestinian Authority-ruled West Bank and a Hamas-ruled Gaza Strip – even more Israeli restrictions were enforced. “The ban on goods from Gaza being marketed to Israel and the West Bank has crippled the agricultural and manufacturing sector. Unemployment in Gaza is one-third of the workforce. Humanitarian assistance is above 70 percent,” said Sari Bashi, director of Gisha, a legal centre backing freedom of movement. Under the 1993 Oslo agreement, Israel has a responsibility to treat the West Bank and Gaza Strip as a single, territorial unit. But Israel only allows Palestinians from Gaza to access the West Bank in “exceptional humanitarian cases”. This has largely meant medical patients and their companions, and merchants. “Families are separated. Students cannot access their studies. Workers cannot access professional opportunities and the fragmentation of Palestinian society is exacerbated. While Israel has a right to conduct security checks on those seeking to travel through Israel, it must recognise the right of Palestinians to travel and choose their place of residence in Gaza and the West Bank,” Bashi told IPS. The closure policy has also had a devastating impact on healthcare services. According to Medical Aid for Palestine, hospitals in Gaza are operating with only 40 percent of essential medicines, and 65 percent of medical disposables are at zero stock. There is not enough staff, medical professionals are sometimes forced to re-use rubber gloves, and equipment is often broken, outdated, or altogether missing. In August, the United Nations found that, should the current Israeli restrictions be maintained, Gaza would be unlivable by 2020. In particular, population growth – which would result in a density of more than 5,800 people per square kilometre – and lack of adequate access to water, electricity, health and education are exacerbating the situation.